A friend of mine makes honey. Or, rather, the bees make it, I suppose. His part in the process is vital, however. The bees haven’t mastered the trick of getting the honey into the jars as yet. And the jars are important. Apparently they are of a special kind. Tim (my friendly apiarist) buys them from a specific supplier. Who knew? 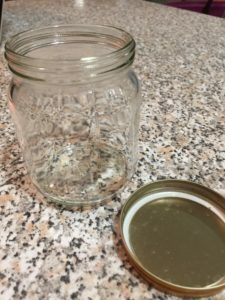 I’m very grateful for my personal honey supply (goes marvellously on toast, porridge, yoghurt), and I know he’s grateful when I return the jar – empty and clean. Of course, it is then refilled and returned to me as soon as feasible. My honey-fest continues. A spiritual parallel occurs to me. We’re all filled with the Spirit at baptism, but, like Moody was reported to have said, “I leak”. There’s a need for re-filling. The theological details of this image could be refined, but human experience tells us that, even though we have the Spirit, we feel empty and needy at times (“Who is weak, and I do not feel weak? Who is led into sin, and I do not inwardly burn?” (2 Corinthians 11:29 NIV11). What is the healthy way to respond at those times when everything seems to be “blah”? But this resupply, this refilling, this re-energising can only happen if we bring back the jar. When it is empty, clean it, pick it up, take to the master apiarist and he will replenish it with sweet honey. Prayer and reading God’s Word are most necessary when we are most empty. When we least feel like it. When it is least convenient. But, God give us all strength to bring back the jar again and again so that we may experience, “How sweet are your words to my taste, sweeter than honey to my mouth!” (Psalms 119:103 NIV11). Always, always, always bring back the jar.